Male infertility can be defined as the inability to cause pregnancy in a fertile female by male counterpart. Generally male infertility is caused due to low sperm count, hormonal problem or presence of low number of motile sperms. Fertile male requires normal functioning of hypothalamus, pituitary gland, and testes. However some of the other common causes of increasing infertility in male includes consumption of alcohol and drugs, rising stress level, obesity, smoking, and environmental toxins. Globally increasing awareness and reducing shyness between people about disease is expected drive the demand for the male infertility treatment during the period of study. Geographically North America dominated global Male Infertility Treatment market driven by best in the class healthcare infrastructure, advanced facilities and awareness and openness amongst citizens towards the disease. North America was followed by Europe and Asia-Pacific as second and third largest market for male infertility treatment market. Asia Pacific is projected to have fastest growth, owing to rapidly increasing healthcare infrastructure and increasing awareness amongst population, and growing medical tourism industry in developing nations such as China, and India in this region. This report identifies the global Male Infertility Treatment market size in for the year 2014-2016, and forecast of the same for year 2021. 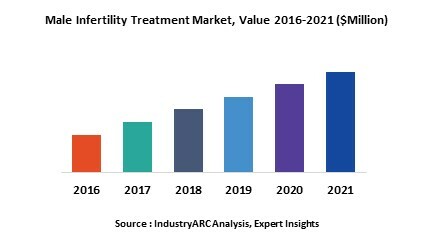 It also highlights the market drivers, restraints, growth indicators, challenges, and other key aspects with respect to global Male Infertility Treatment market.